Thanks to Roger Cawse and Terry Guswell for their help. 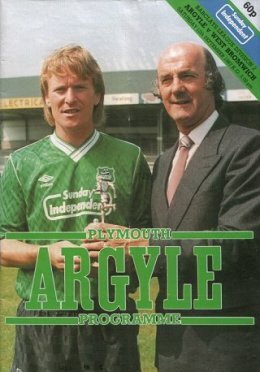 For Argyle: Dougie Anderson's debut; Stuart Evans playing on the wing! For Albion: Andy Gray's debut for WBA; one Mr Carlton Palmer, just 21 and reassuringly making a hash of a clearance; George Riley (we remember him) playing at centre half; and definitely one not to miss, one of the most reckless challenges on a keeper since Nat Lofthouse. 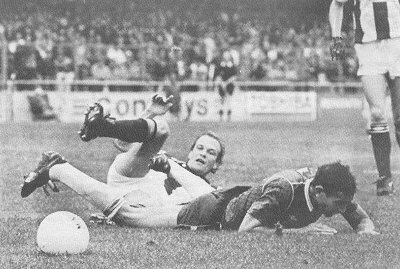 Tommy Tynan tries to find a way through; also Stuart Evans, Kevin Summerfield and Mark Smith. 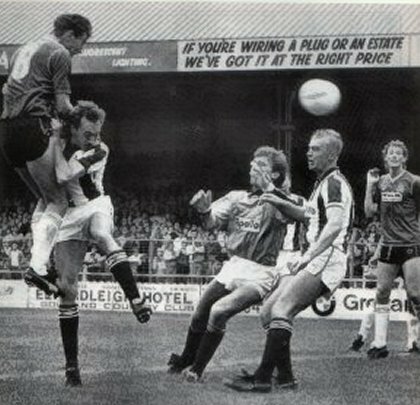 An expensive collision as Argyle's record �175,000 signing Mark Smith comes to grief with one million pound man Andy Gray on his debut for West Brom. Old fashioned soccer logic was replaced by a gambler's dice as both sides chanced their luck in an exhilarating finale more akin to a game of snakes and ladders. Fortunes rose and fell with cheers and groans in the wake of almost every attacking throw, and nothing was certain until West Brom snatched an equaliser with the last touch of the game. For 70 minutes the game was no different from any other on a wet and blustery Saturday afternoon. Albion, clearly revitalised under the influence of new manager Ron Atkinson and the arrival of former Scottish international Andy Gray, were well-worth their 1-0 lead. Argyle, in contrast, looked more like the team struggling for goals and points and giving few clues why their previous month's displays had earned manager Dave Smith his pre-match gallon of whisky. But, completely out of the blue, Argyle were level and all the sterility and toil in their performance exploded into a riveting spectacle in which anything could happen ... for either side. Five goals and a twice-taken penalty - ultimately saved heroically by Steve Cherry - were crammed into a fast moving, unpredictable ending that would probably have produced even more surprises if the referee hadn't taken the ball away. It was great entertainment for the fans but all added up to a nightmare for the managers and coaches watching their pre-match defensive strategy fall apart at the seams. Argyle�s new attacking formation with Stewart Evans operating on the flanks and John Clayton back partnering Tommy Tynan didn't look like succeeding until the 69th minute when newcomer Dougie Anderson lobbed an ambitious shot goalwards from the wing. Goalkeeper Stuart Naylor and defender Martyn Bennnett had the ball covered but were both taken by surprise by Tynan's jack-in-the-box leap. His head gave it just enough height to clear the keeper. 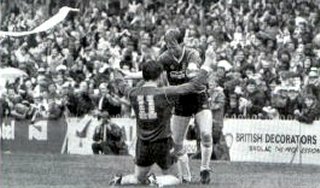 Just three minutes later Argyle were in front and, amazingly, the scorer John Clayton might not have been around to enjoy his triumph if the referee had seen the number eleven board being hoisted from the Argyle dug out only seconds earlier. No sooner did it disappear than Clayton, who was suffering from a knock, raced to take up a forward position for John Matthews' free-kick and went sprawling to send his header curling around Naylor's delayed dive. George Reilly drilled home an 80th minute spot kick, only for Albion to be punished for Gray's encroachment into the area. Reilly tried again, aiming in the same direction but was left cursing his misfortune as Cherry guessed correctly to parry the shot away to safety. 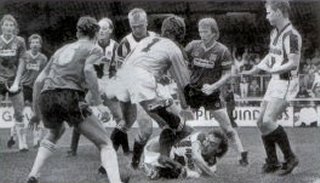 Then Reilly's hesitation compounded by Carlton Palmer's indecision cost Albion another goal in the 83rd minute. Tynan was given just the right amount of freedom to dribble around the two static Albion defenders, turn back and stab the ball home. Argyle, now 3-1 up, should have secured their lead there and then. Instead they allowed Gray far too much room at the other end and his 85th minute header sailed in. They still had time to hold fast as the final minutes ticked away. But they relied too much on Cherry's daring deeds to preserve their hopes, and he was beaten again when an injury-time free-kick from Darren Bradley sent a swarm of players descending at the far post. Palmer's head did the damage. Argyle - Cherry; Brimacombe, L. Cooper, Matthews, Law, Smith, Anderson (Rowbotham), Summerfield, Tynan, Evans, Clayton (S. Cooper). West Brom - Naylor; Palmer, Cowdrill, Bennett, Reilly, Bradley, Hopkins, Goodman (Bennett), Gray, Singleton, Morley, Williamson (Dickinson). Scorers: Argyle - Tynan (2), Clayton; West Brom - Gray (2), Palmer. Referee: Mr. D. Hutchinson (Cambridge).